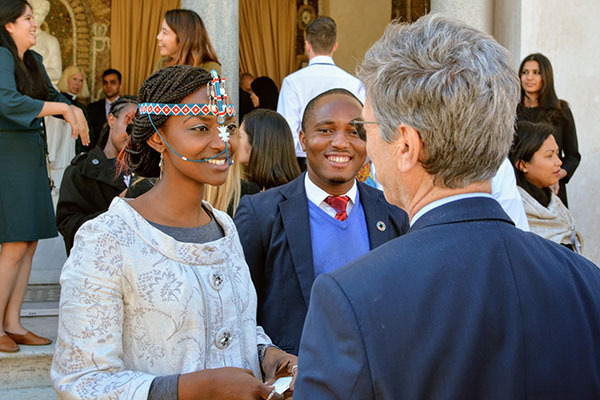 Last week researcher Margaret Koli presented the work of the Pan African University Institute of Water and Energy Sciences (PAUWES) project at the Vatican Youth Symposium, hosted by the Pontifical Academy of Sciences and the UN Sustainable Development Network. According to the African Union, 60% of Africa’s population is currently 24 years and under and the majority of the continent’s labour force work in the agricultural sector, accounting for 25% of the continent’s GDP. Unparalleled environmental challenges, such as droughts, infertile soil and unreliable sources of energy are making livelihoods in rural villages unsustainable. Many young people migrate to cities in search of economic opportunities, but cities also have their own set of challenges. As part of the PAUWES project, UNU-EHS focuses on providing quality education and innovation to African students. In a cooperation with the Pan African University Institute of Water and Energy Sciences hosted at the University of Tlemcen in Algeria, UNU-EHS scientist work with students, mostly between the age of 22 and 30 from different African countries, on leading academic research and the latest theoretical and hands-on training in areas vital to the future of Africa’s development. The particular focus of the masters and doctoral education is in water and energy engineering and policy. This includes the nexus between water and energy issues as well as climate change. Empowering youth with quality education, and in turn providing communities with knowledge, tools and skills within an ecosystem that allows them to develop solutions to daily societal challenges sets a strong foundation for a strong Africa. Learn more about our work in the PAUWES project here.